Tim Flinders will graduate from Grand Valley State University next month. Raised Lutheran, he also explored fundamentalist Baptism, Roman Catholicism and even Messianic Judaism before converting to Orthodox Christianity this year. Flinders, 22, like many other young people converting to Eastern Orthodoxy, was looking for authenticity and historical accuracy in his Christian faith. said Flinders, who added he wrestled with the many divisions of the Christian church over the years. He was chrismated Holy Saturday at St. George Orthodox Church in Grand Rapids. Chrismation is akin to confirmation. Recently he attended the second annual Encountering Orthodoxy Conference at Hope College. The Rev. Deacon Nicholas Belcher, dean of students at Holy Cross Greek Orthodox School of Theology in Boston, gave the opening keynote address, using the themes of holy week to introduce Orthodoxy to the more than 50 who attended. Eastern Orthodox Easter, Pascha in Greek, fell on the same day as Western Easter this year. 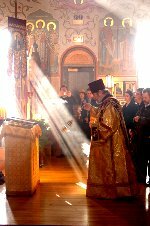 Eastern Orthodox Christians, he explained, experience the crucifixion and resurrection in the now during liturgy. “There is no sense that we are just talking about something that happened a long time ago. It is today,” he said. He, too, said he was looking for the apostolic, historical roots of the Christian church. Miller considers himself non-denominational and said he didn’t know the Hope campus had Orthodox students. “I’ve been trying to figure it out, trying to find what best fits me,” Miller said. The Orthodox Christian Fellowship campus club, which sponsored this month’s conference, meets Thursday nights for Small Compline (a short Psalm and evening prayer service). Then the handful of Orthodox students, one seminary student and Fr. Steven VanBronkhorst discuss topics such as biblical foundations for Orthodox worship. He would like to see more inquirers at the OCF meetings and more students at the second annual Encountering Orthodoxy Conference. VanBronkhorst was a Reformed Church of America minister for almost two decades before coming to the Orthodox church 14 years ago. Still, VanBronkhorst said, he sees many more today looking for the historical church than when he was doing his own searching. Tyler Dykstra of Holland was chrismated this month. “Over time I started to realize there was so much history I had not known about even though I had gone to Christian schools all my life,” Dykstra, 24, said.